September 24, 2012 By This post may contain affiliate links. 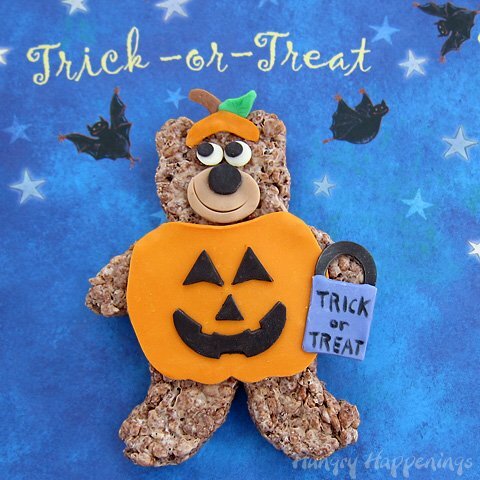 You absolutely have to make these delicious Cocoa Krispies Trick or Treat Bears! These bears are dressed up in a yummy pumpkin costume, they may be too cute to eat! About a month ago, Callye from The Sweet Adventures of Sugarbelle proposed a challenge for a group of bloggers and I was so honored to be included. She asked each of us to use a simple pumpkin shaped cookie cutter to create an edible craft project. Now, being in such amazing company really motivated me to come up with something special. I spent three weeks looking for inspiration and finally found it while digging through bins of Halloween decorations. 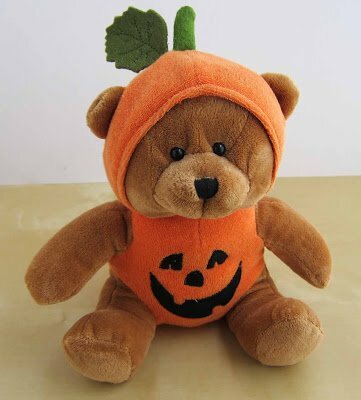 As soon as I picked up this cute little Halloween bear, I knew what I should create. 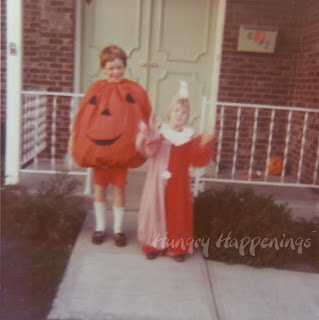 The funny thing is that a day after I made this decision, I was showing my exchange student some old pictures, and found this one of me, at age 8, ready to go out Trick or Treating with my sister. Now I was sure it was the perfect pumpkin project, so I got to work in the kitchen making bears out of Kellogg’s Cocoa Krispies Treats decorated with modeling chocolate costumes. I’ll admit my bear treats did take a bit of time to create, but if you could have seen the look on the faces of the children I gave these too, you’d know all the work was worth it. 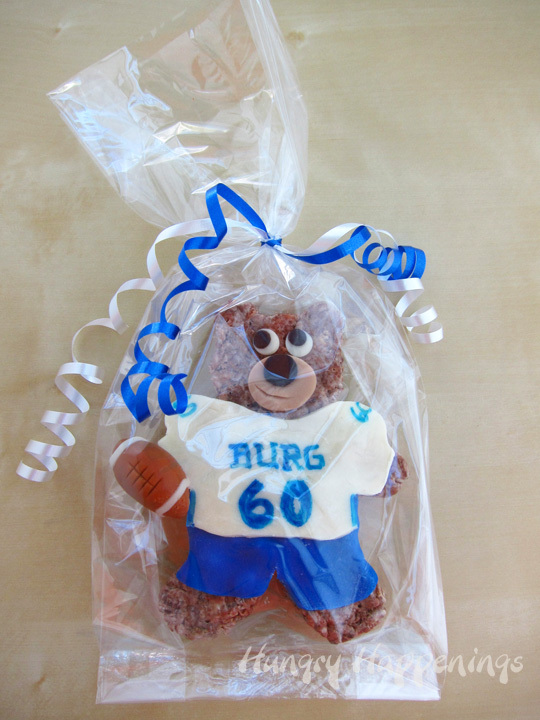 Not to digress too much here, but I even got a big smile out of my nephew when I presented him with a bear dressed up in his high school football uniform. Next I’ll have to tackle a bear in a school mascot costume, as he has taken on that challenge himself, dressing as a Viking and entertaining the crowds at games. 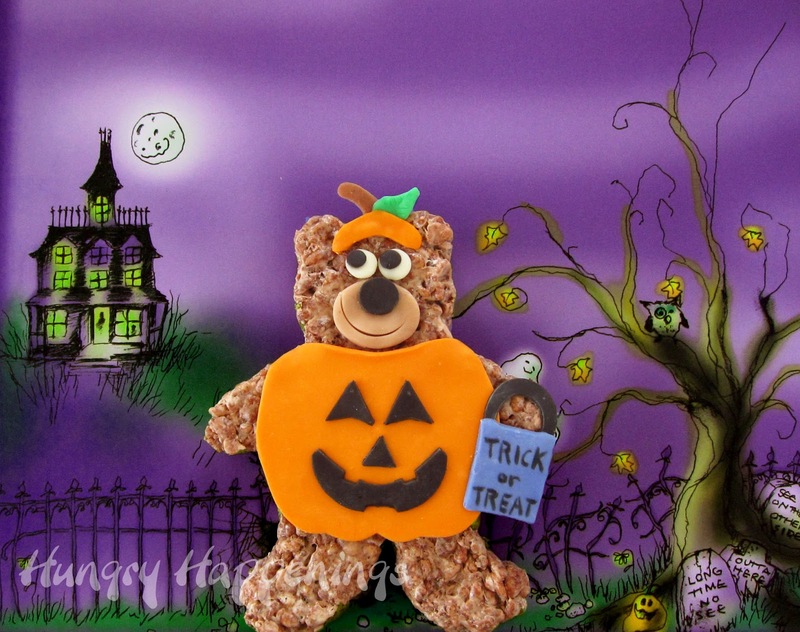 Creating these Cocoa Krispies Trick or Treat Bears was like playing with paper dolls. These bears could wear just about any costume you can create. Oddly enough, as a kid, I even dressed up as a football player one year. 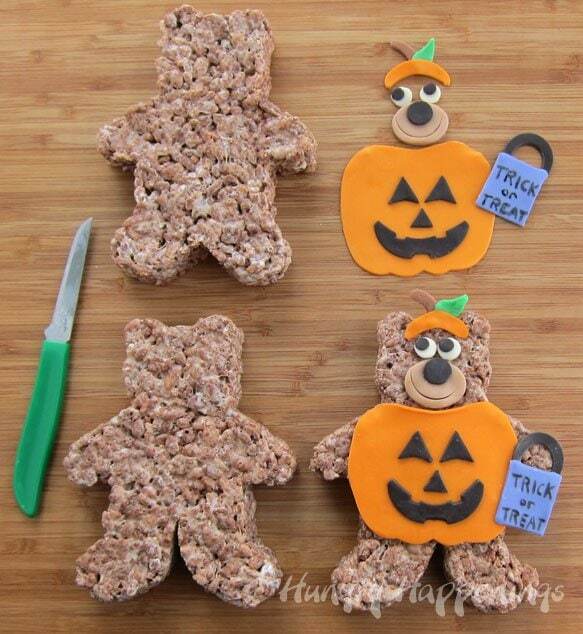 I have a few Cocoa Krispies Bears left who are in need of costumes. I may just have to spend some more time designing for them. I’ll be sure to share them if I do. Of course, they may just end up as afternoon snacks. Before you begin, you’ll need to make a batch of white modeling chocolate. You can find the recipe and complete detailed instructions on using and coloring modeling chocolate here. This chocolate making tips page also has troubleshooting information if you end up with greasy or dry modeling chocolate. Make your Cocoa Krispies Bears: In a large pot, heat the butter, marshmallows and milk chocolate over low heat, stirring often until melted. Or, put those ingredients in a large microwave safe bowl and heat for 20-30 second increments until melted. Do not over heat or you’ll burn the chocolate. Stir the Kellogg’s Cocoa Krispies into the melted marshmallow mixture, coating it well. Butter the inside of your bear shaped cookie cutter then set it on a piece of well buttered tin foil. Fill the cutter completely with the Cocoa Krispies treat mixture. Press down on the cereal to compact it in the cutter. Remove the cutter and you’ll have your first bear. Repeat until you’ve used all the cereal. Color some modeling chocolate orange, black, green, purple, and light brown, being sure to leave a small amount white. See detailed directions here.Dust work surface lightly with powdered sugar. Use a rolling pin to roll out pieces of each color modeling chocolate to about 1/16th of an inch or so. Attach pieces of modeling chocolate together with a small amount of water. Example: brush the backside of the jack-o-lantern features with water and press them onto the pumpkin.Use a black food coloring marker to write “Trick or Treat” on the purple rectangle. Cute in between the bears legs with a knife. 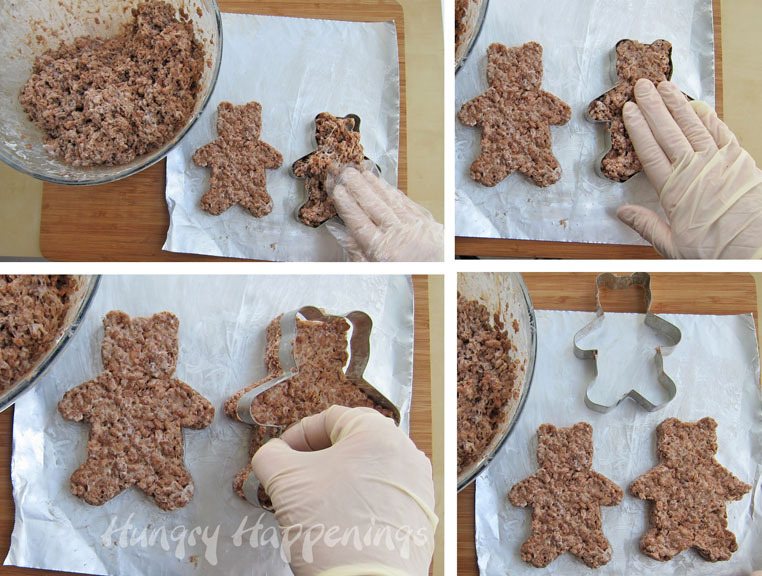 Use frosting or Nutella to attach the modeling chocolate pieces to the bears. Wrap in clear cellophane bags and tie with a ribbon if using as gifts, otherwise just keep stored in an airtight container for up to a week, maybe more. 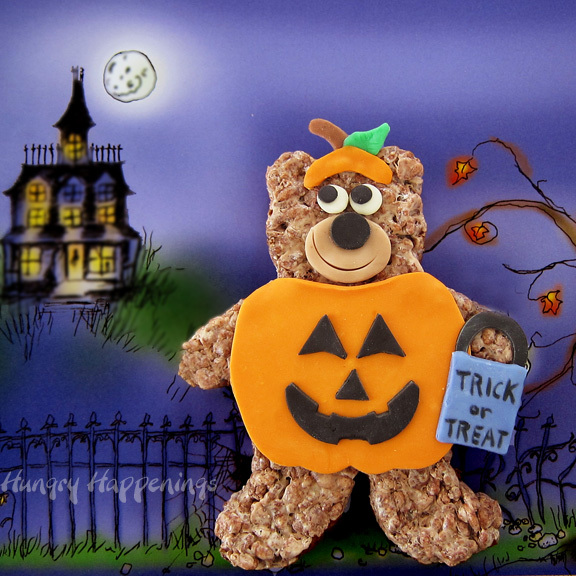 For Sweet Sugar Belle’s challenge I did make a traditional looking jack-o-lantern as the costume for my Cocoa Krispies Trick or Treat Bear, but as you’ll see below many of the food artists used their cutters to create anything but ordinary looking pumpkins. I am in awe of the talent in this group, aren’t you? Wouldn’t you just love to see how each of these creative sweets were made? 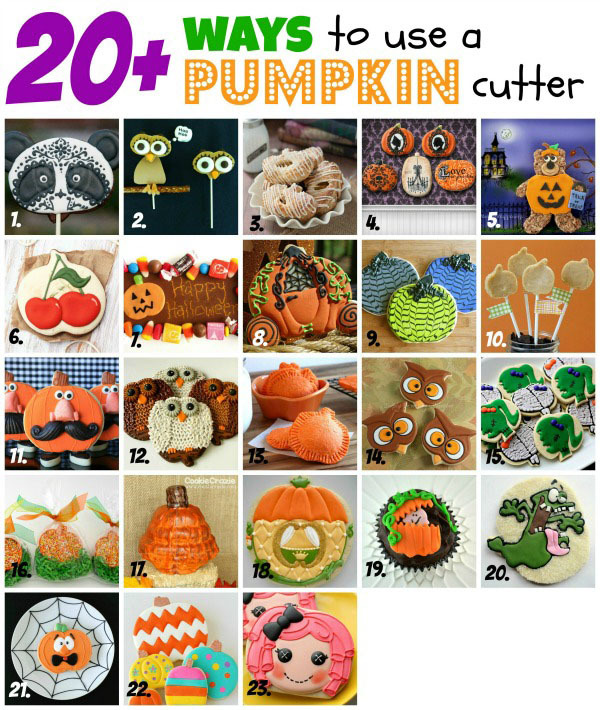 I know I can’t wait to visit each an every site for tutorials and tips on each of these 20+ ways to use a pumpkin cutter. Previous Post: « Build a Halloween prop using a costume and pvc plus a costume giveaway. This little bear of yours is completely adorable! I would love to have him trick or treat at my door! I knew this cute bear was yours as soon as I saw him:) He has your creative signature on him! Love you trick or treat photo too! Thanks, Sue. I found it so fun to see all of the projects, and like you did, spot those from specific bloggers. I'm glad you recognized mine! This looks like sooooo much fun to make! Wow! You are really creative! These are darling, thanks for sharing. that is super cute! great idea for halloween! These are so adorable! So glad to have discovered you through this project. I will be keeping up with your blog now through emails. Great job! So adorable!!! I just love these little bears! No way could I possibly eat them, way too sweet! So happy to be working on this project with you! First — I LOVE that you shared your Halloween costume picture!! So cute! And these bears are so creative! 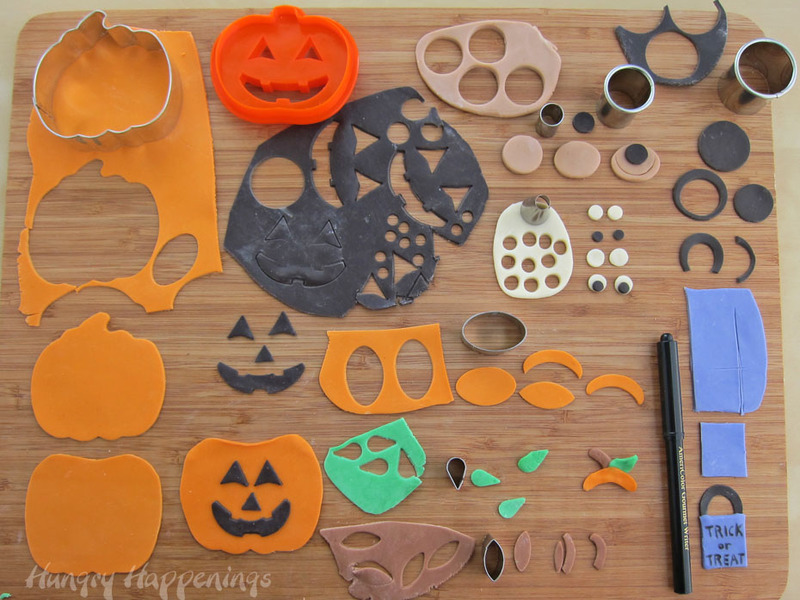 SUCH a good way to use the pumpkin cutter! That turned out so adorable, I love the "fur" effect with the cocoa krispie treats, it really works. Nice photo of you trick or treating, too, I used to think it would never get dark on Halloween so I could go out and get the treats. 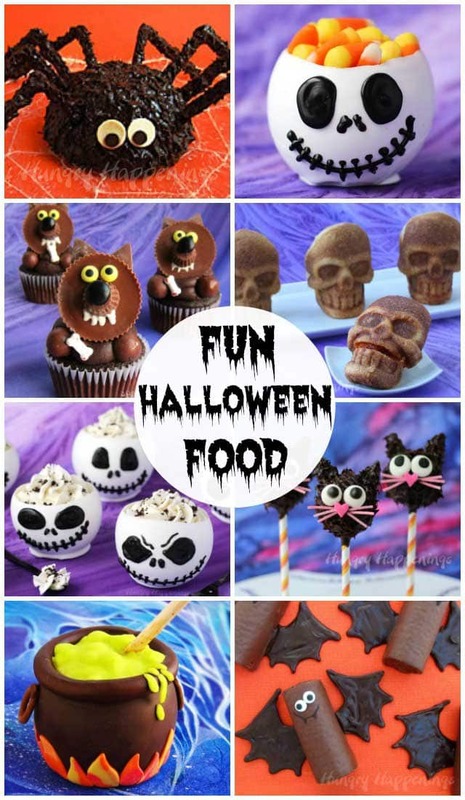 These are adorable, I am going to link back to them in my upcoming Halloween Recipes Post! Oh my goodness, I just LOVE these!! So cute and creative!! 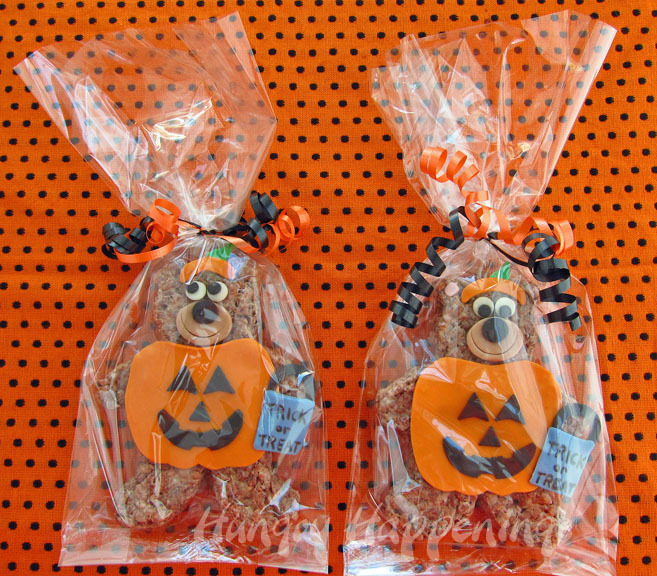 I would love one of these adorable treats as a party favor! So dang cute! I want to eat him right up 🙂 Pinning and featuring tonight Beth! Thanks so much for sharing at Mom On Timeout!